For the past year or so, I’ve been hearing bits and pieces about a group called the Northfield Roundtable (also referred to with three words–the ‘Northfield Round Table‘–making online searches trickier). They met last Saturday in the conference room of the Archer House and I took a few photos. Blake Abdella, Dixon Bond, Rick Estenson, Margit Johnson, Bruce King, Joel Leer, Art Monaghan, Suzie Nakasian, Dave Neuger, Brett Reese, Fred Rogers, Jennifer Sawyer, Alice Thomas, Dave Van Wylen, Steve Wilmot. How did the group form? How were members selected/invited? What is their mission? Who do they report to? Where are the results of their planning sessions? It’s tough to find out, as there’s no overview document, brochure, or website for the group that I could find. Has the Northfield News, KYMN, or Northfield Patch done any reporting on the group? Apparently not. Commissioners Davis, Imm, Herreid and Schulte participated in a workshop sponsored by the recently-formed Northfield Roundtable. Commissioners Nakasian and Thomas were also participants in the workshop as Roundtable members. Other participants included Messrs O’Connell and Olson. 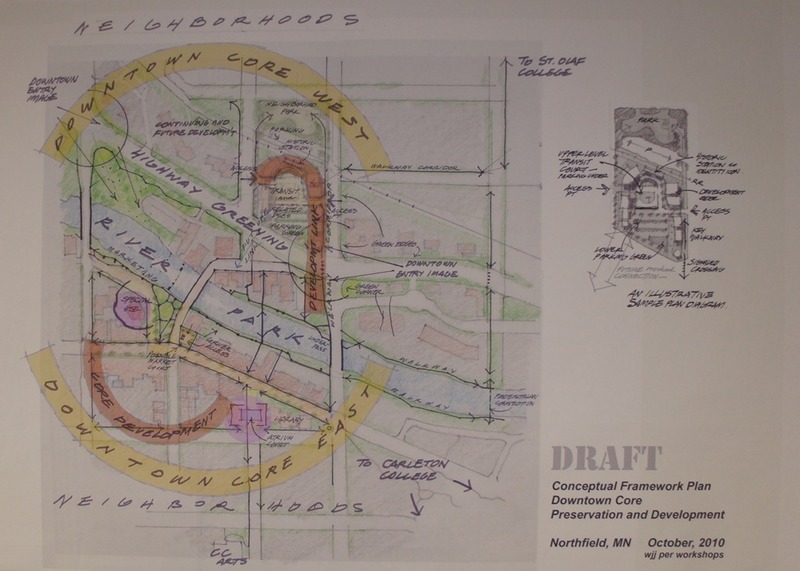 The fifteen members of the Roundtable, all volunteers, work to clarify, support and facilitate a clear vision and framework for development and redevelopment opportunities that enhance the economic vitality and livability of Northfield. The workshop was conducted to solicit ideas for improving connectivity and encouraging development in the rectangular commercial area bisected by 2nd Street, touching the Library and Q-Block on the east and west, and extending north to south from the Crossing to Bridge Square. Ideas solicited by a consultant from the workshop participants will be packaged by the Roundtable into a future report. 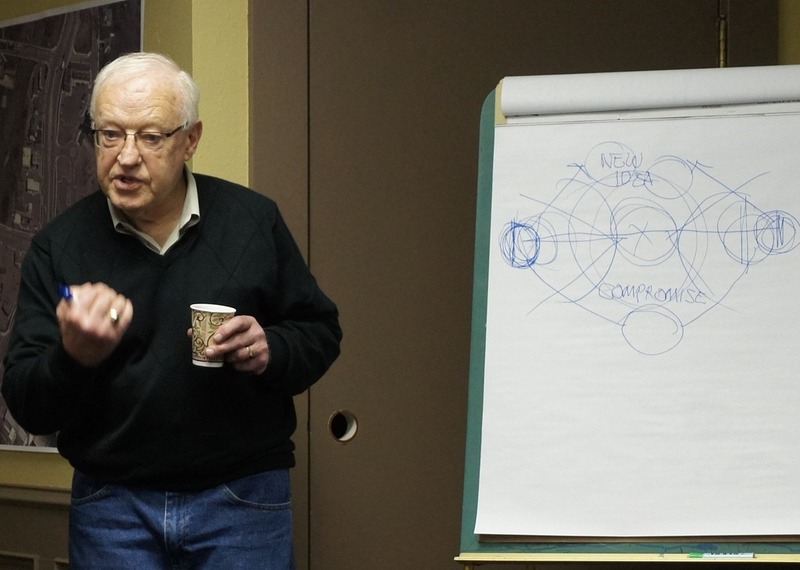 So it seems that a group of influential community members has formed on its own to conduct brainstorming/planning sessions for Northfield-related public development, with public financial support, without much (any?) public process, public transparency, or public engagement. Sure, whatever results or recommendations generated by the Northfield Roundtable would go through the various public bodies (Planning Commission, City Council, etc.) before any actions are taken. But by then, all the educational opportunities are gone, the interesting discussions have already occurred, the influential positioning has taken place, and average citizens are pretty much left with just weighing in pro or con, as any public hearings appear to be mere formalities. 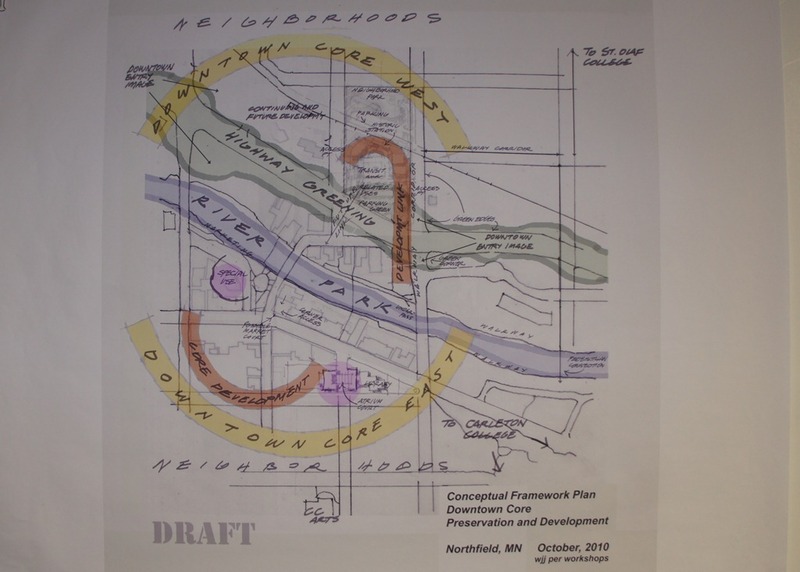 Presentation: Dave Van Wylen reported on the current activities of the Northfield Roundtable, a group of citizens working on community planning and guided by Urban Designer Bill Johnson. Their purpose is to facilitate long-range planning in order to enhance the economic vitality and livability of the city. Their early focus has been on the Highway 3 corridor and the Cannon River. Next steps include gathering insights from other groups, developing a draft of framework and meeting with the council in a work session to communicate these. Steve Edwins, a TF member, noted that there are ties with the work of the Roundtable. Over the last few months, group members have met with elected officials, community leaders, developers and more. Now, they’re taking their message to the wider community, looking for input and listening ears. One supporter of the roundtable is Mayor Mary Rossing, who sees its role as different, but complementary to the city. Private groups like the roundtable have much more leeway than public entities and are better positioned to act as a catalyst for development, she said, especially with the business community which often bristles as the required openness of the public process. Most economic development, said Rossing, occurs privately, with the city lending a hand where it’s able. The Northfield Roundtable, in conjunction with Northfield in Bloom, host a discussion about Greening the Commons from 7 to 9 p.m. Monday at the Northfield Community Resource Center. The “commons,” formed by Hwy. 3, the railroad, and the river as it passes through the city center, has been identified as an important visual representation of the city of Northfield that can set the tone for visitors and passersby. This is an area that could be transformed by an integrated and thoughtful beautification strategy. The goal of the evening is to begin planning and to create implementation strategies to make Greening the Commons a reality. Nfld Patch: Northfield’s Hwy. 3, With Trees?